NSK was created in 1930 by NAKANISHI as a manufacturer specializing in super high-speed rotary cutting technology. With revolutionary capabilities and precision that enable new, more sophisticated treatment, NSK’s range of businesses has been expanding from dentistry to general industry, and even into the field of surgery. Today, NSK’s goal is to become the No. 1 brand for all these devices: To make contributions to the health and peace of the global community through manufacturing high quality products and foster friendships with people worldwide. 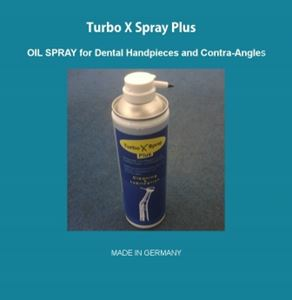 Oil Spray, Turbo X Spray Plus This Germany make Turbo X Spray plus is best used oil spray for cleaning and lubricating all handpiecs , contra angles and turbines.